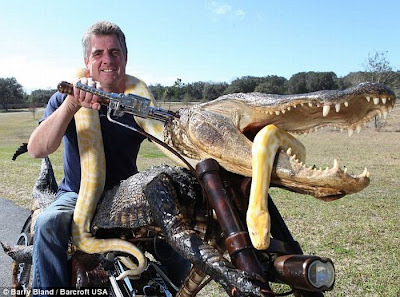 We often preach for preservation of wild life, but when wild animals grow in number and become a threat to themselves and human life, then emerges such custom-made bikes for the betterment of the species. 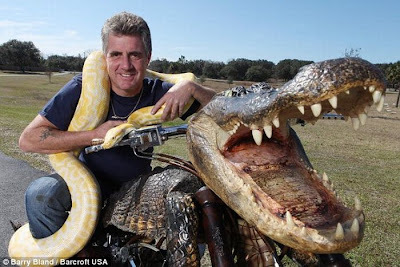 Commissioned by the owner of the Wildlife Rehabilitation of Hernando (WROH) in Florida, Jim Jablon, Swedish craftsman and leather expert Benny Ohrman has crafted a wild motorbike dubbed “GatorBike” from the skin and skull of a real alligator, yes, you got it absolutely right. Powered by an influential Ultima engine to reach a top speed over120 mph, the custom-made bike attaches the head permanently into the handlebars to implant the speedometer and other gauges into the back of the skull, while the skin can be removed after the ride. 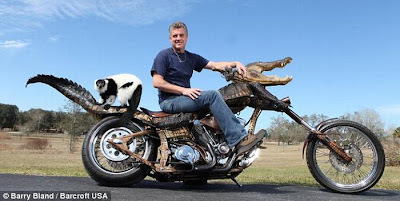 Intended to raise funds for a wildlife charity, the £51,000 alligator bike will be auctioned in May in Fort Lauderdale.